Hello and welcome to another edition of Mastication Monologues! Today I will be bringing you a bit of the Rainbow Nation, a.k.a. South Africa,in the form of the restaurant Braai Republic. Here’s how to get there: Come out of exit 4 of Itaewon Stn. (line 6), walk straight and turn left at the alley just before the McDonald’s. 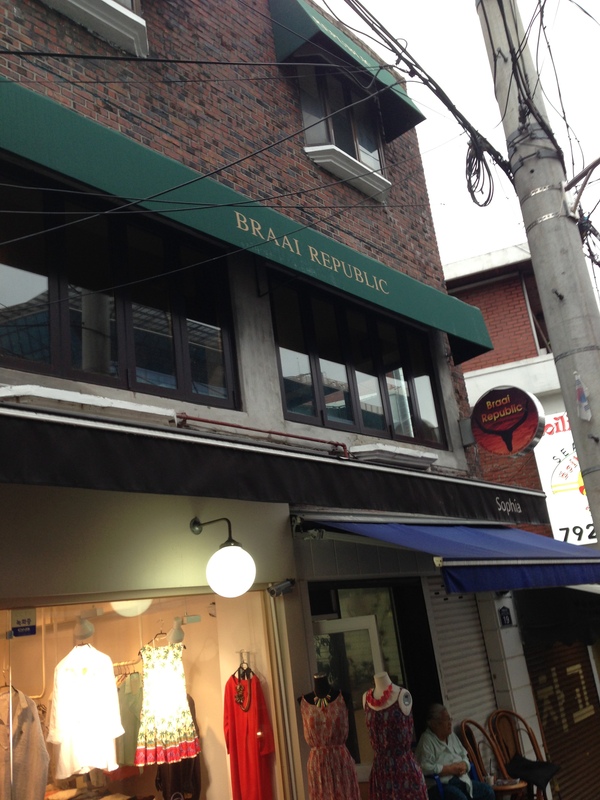 Go through the intersection, past the Juliette clothing store, and Braai Republic is on your left on the second floor. 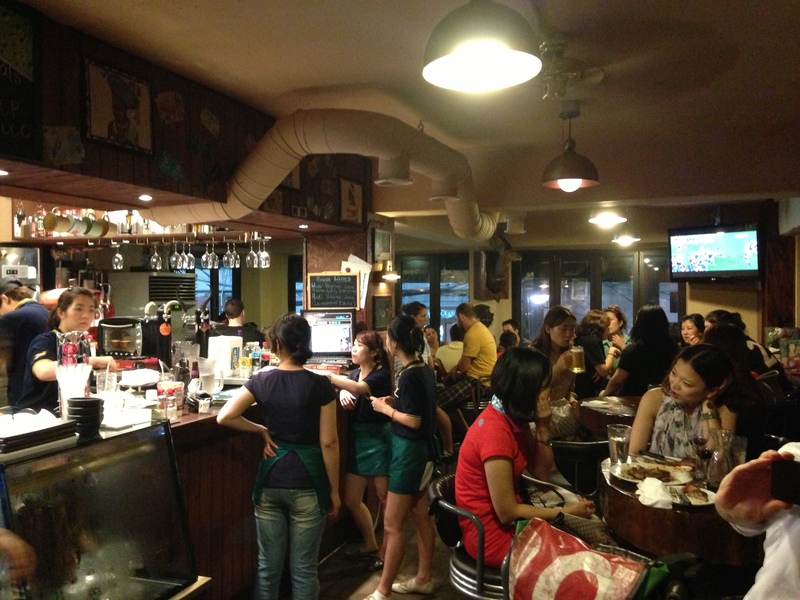 When we first arrived on a Saturday evening around 6:30 pm, we were greeted with a wall of people in the establishment. Little did we know that Saturday evenings was the worst time to come and eat. So instead of my entire group of friends coming to eat with me, it just ended up being my one friend, Aaron, and I sharing a table with another American couple since it was so crowded. I personally enjoyed this aspect of the restaurant because it encouraged more socialization over the meal. 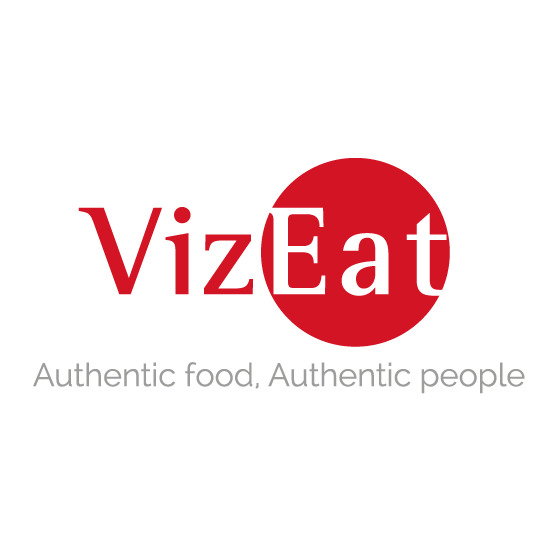 A welcomed change from most restaurants where diners are more engrossed in Instagramming their food and ignoring the person they’re sitting with. 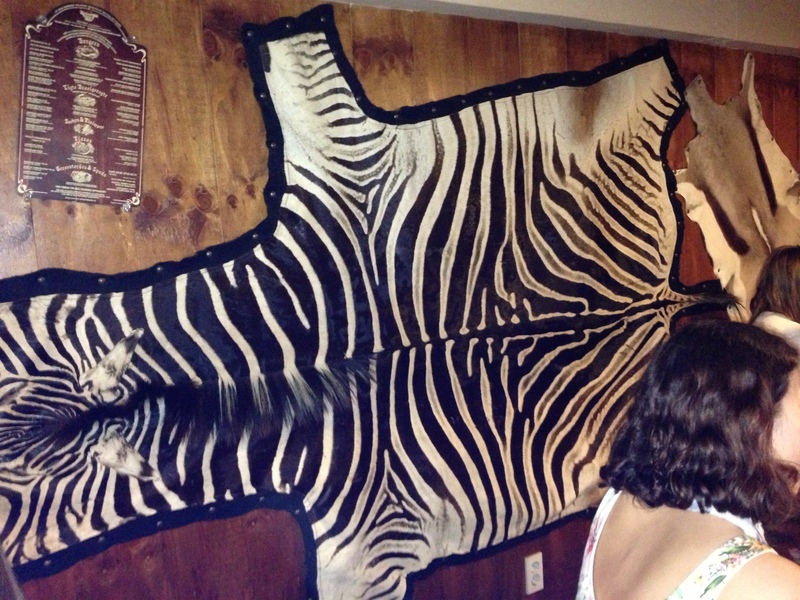 I definitely had my cell phone away as I was soaking in the South African inspired decor like the zebra skins on the wall, a rugby match on the tv, and the extremely enthusiastic South African owner who was called everyone, “Bru” while making sure they were having a good time. Is it black with white stripes or white with black stripes? I felt like I was in Blood Diamond with Danny Archer. Leo references aside, I scanned the menu and decided to get the Hunter’s Gold cider (5,000 Won) along with the oxtail potjiekos (11,000 Won) (pronounced “poy-kos”). A lot of the other options were meat centered like lamb chops and meat pies and for good reason. 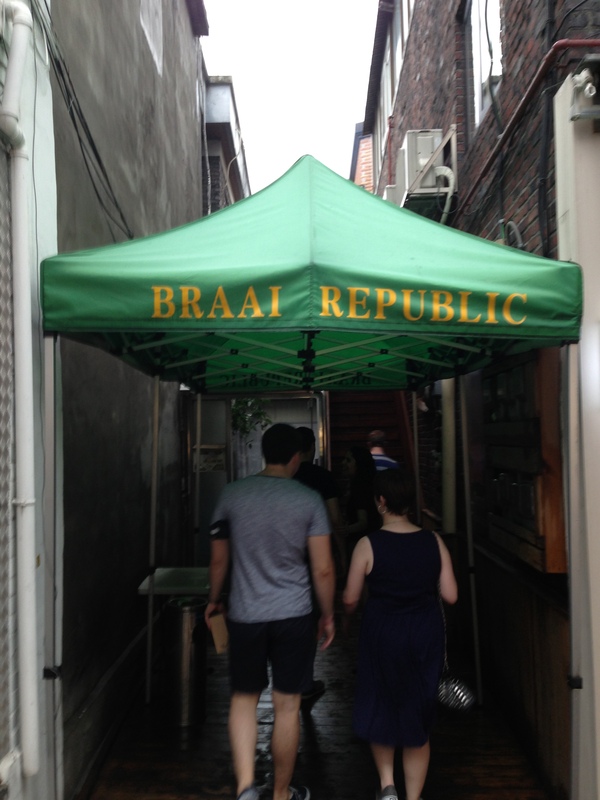 The name of the restaurant, “Braai Republic” references the South African tradition of grilling meat. The word “Braai” in Afrikaans means “grill”. However, there still are some veggie options like various types of mashed potatoes, cole slaw, and pap which is like polenta. I didn’t know what to expect from the meal, so I was quite intrigued when my plate came out. 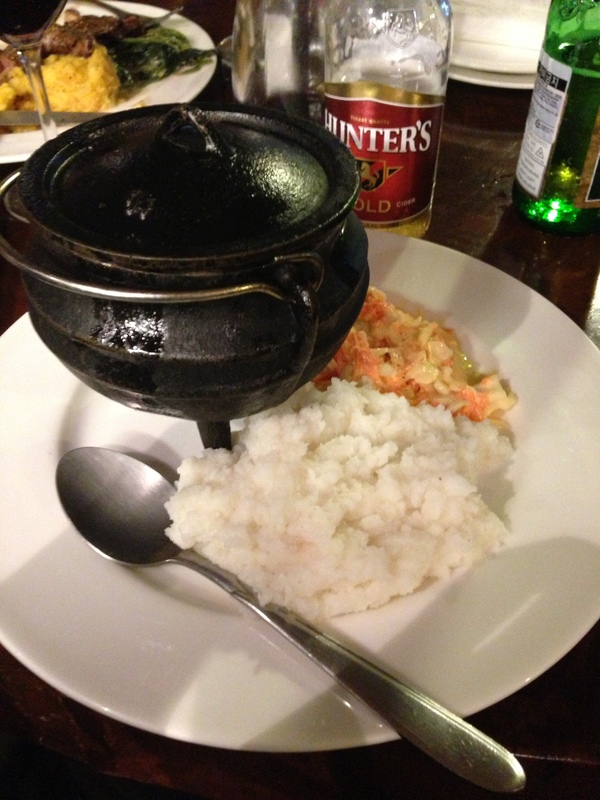 On it was a pile of plain mashed potatoes, orange and white cole slaw, and a small black pot which I naturally concluded was my potjiekos (in Afrikaans, it means “small pot food”). When I opened it up, I was face to face with a whole lot of meat. 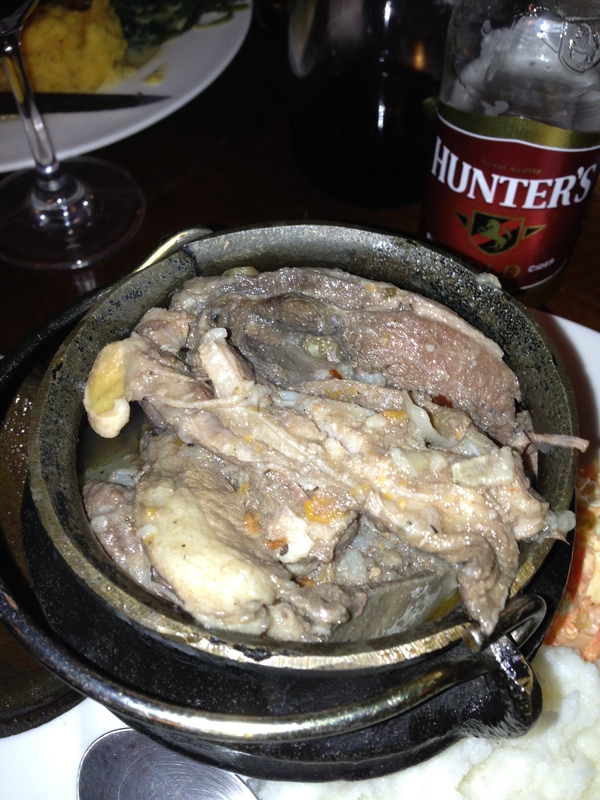 A potjikos is a remnant from the Afrikaaner frontier culture where they would stew different vegetables, cuts of meat, and bones together in a pot at the end of each day after exploring the South African wilderness. I could definitely taste the rustic origins when I finally tucked into it as I was greeted with extremely tender pieces of ox tail mixed in with bone shards. Take your time when eating this dish because you might swallow a bone if you’re not careful. I also stumbled upon the occasional potato lurking below the savory broth like some sort of delicious starchy manatee. If you’re a traditional meat and potatoes kind of person, this restaurant would be your Valhalla (a viking heaven but with funnier accents and more barbecue). Even though I was going to town on my pot of ox, I tried a bit of my table mate’s lamb pie. I would get that in a heartbeat next time I came to Braai Republic. Then I tried my sides. The mashed potatoes were severely disappointing. True, the texture was just short of creamy, but they were extremely bland. I can’t stress this enough even when I put salt and pepper on it. The cole slaw was also quite pedestrian, but then again, I’m not the biggest proponent of cole slaw. Thankfully, the potjiekos was quite filling and made up for the side order of mediocrity. 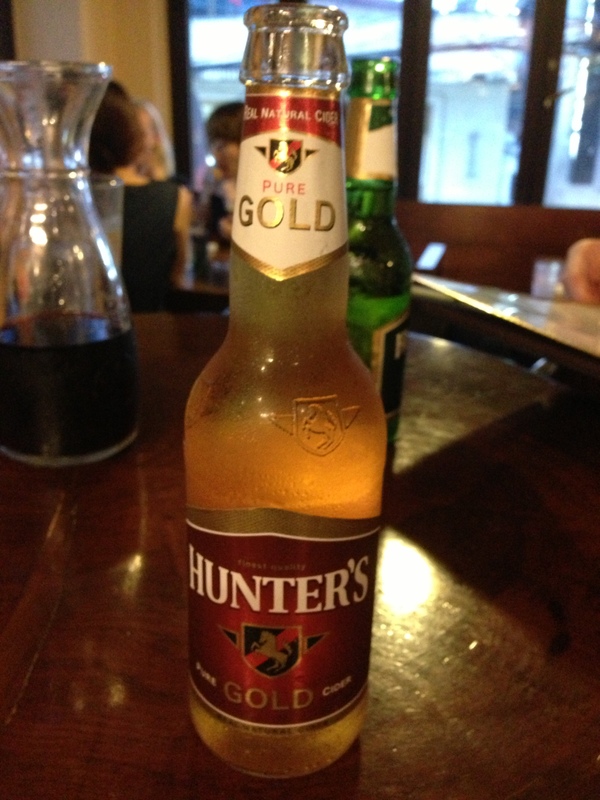 The Hunter’s cider was alright as a beverage to the meal, but it was a bit too sweet for my liking. However, I wasn’t prepared for the greatness for dessert. My friend Aaron had been raving for the longest time about their cheesecake, so I was naturally obliged to try it. With my pie-in-the-sky expectations, this cake didn’t disappoint. It was topped with caramel that was sweet yet slowly developed a more intense flavor with an almost coffee-esque flourish with every bite. Then there was the actual cake which was light and fluffy. It wasn’t dense like traditional cheesecake but rather had a whipped consistency that didn’t leave me feeling stuffed at the end of the meal. The crust was a bit more straight forward forming a solid crumb base for the amazing flavor dance party going on above it. In the end, if you love meat dishes or are just looking to try some of the best cheesecake around, I highly recommend Braai Republic. Posted in African Cuisine, South African and tagged bru, cheesecake, cider, cole slaw, mashed potatoes, ox tail, South African, stew. Bookmark the permalink. The cheesecake would be the one item I ordered, and maybe the beer. 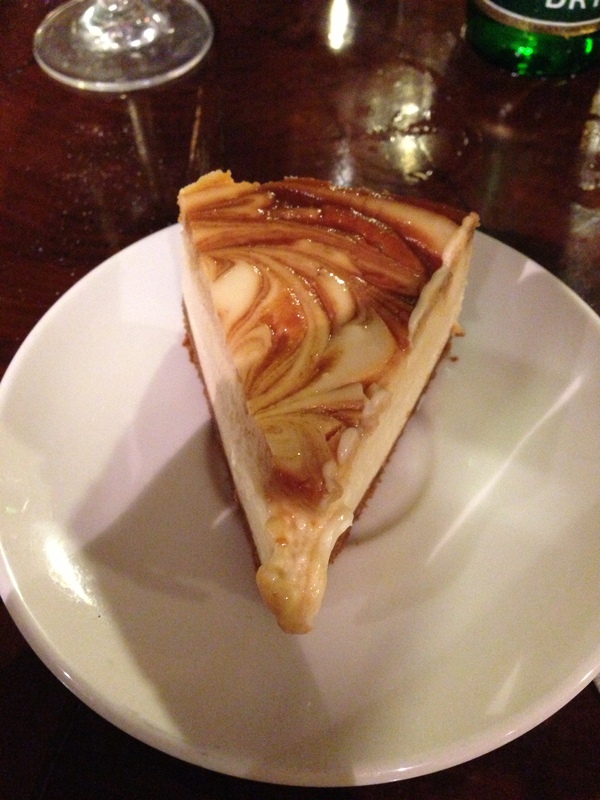 The cheesecake is pretty great, but I’d probably go for a different type of cider next time. You’d love the cheesecake, but I didn’t order beer. It was cider which is kind of like apple juice with a low alcohol content, at least in this case. There are stronger varieties of cider from other countries like England.